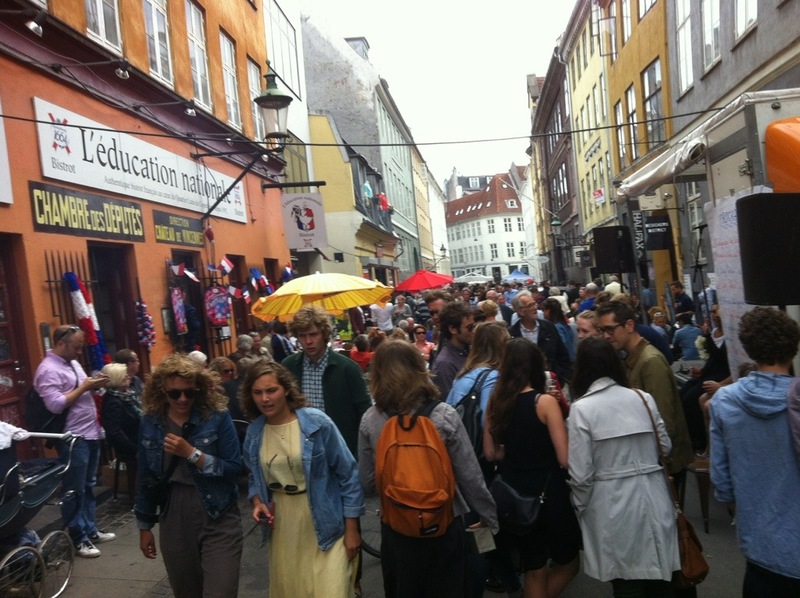 Anyway, if you’re stuck in the city during hot summer weather, Copenhagen is not a bad city to be stuck in. 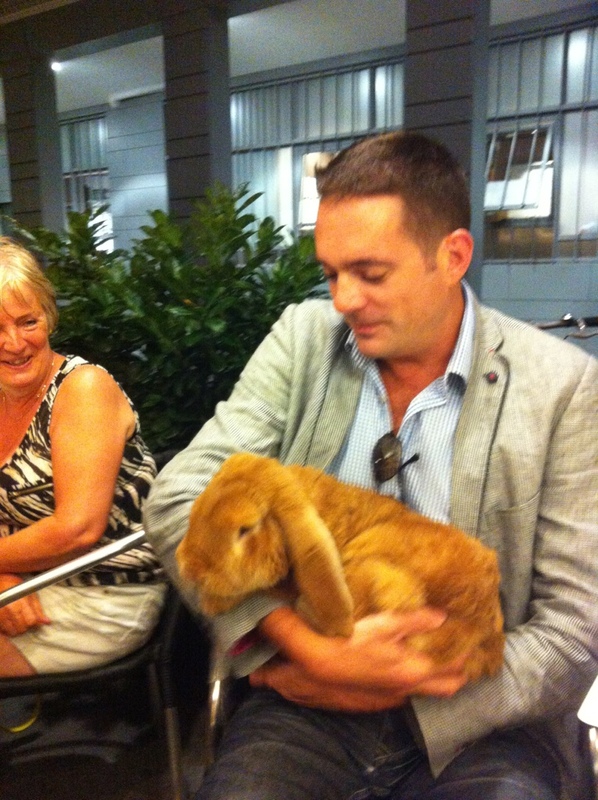 Last night we had dinner with my Mother-In-Law in the shadow of St. Nicolai Church and then went on to a pavement bar where we befriended the largest rabbit I’ve ever seen. One of those absurd moments that are worth commemorating… I’m not sure why the owner brought his pet rabbit into town on a Friday night, but it was adorable in that slightly “MONSTER RABBIT” way. 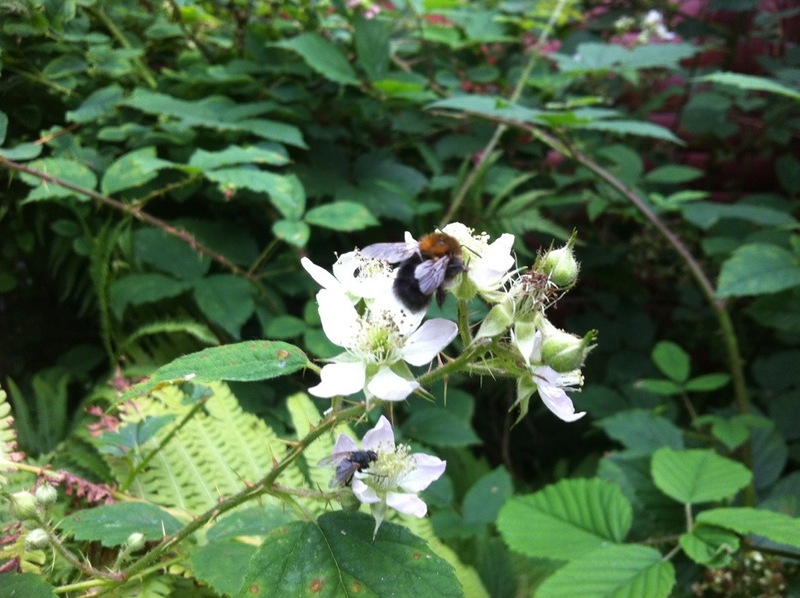 There were literally dozens of them hard at work in the blackberry shrub, and there are hundreds of green blackberries waiting to be ripened and sweetened by the glorious summer weather. Methinks there WILL be blackberry jam this year! But now I really must get off the internet and get that shirt ironed for the wedding today. 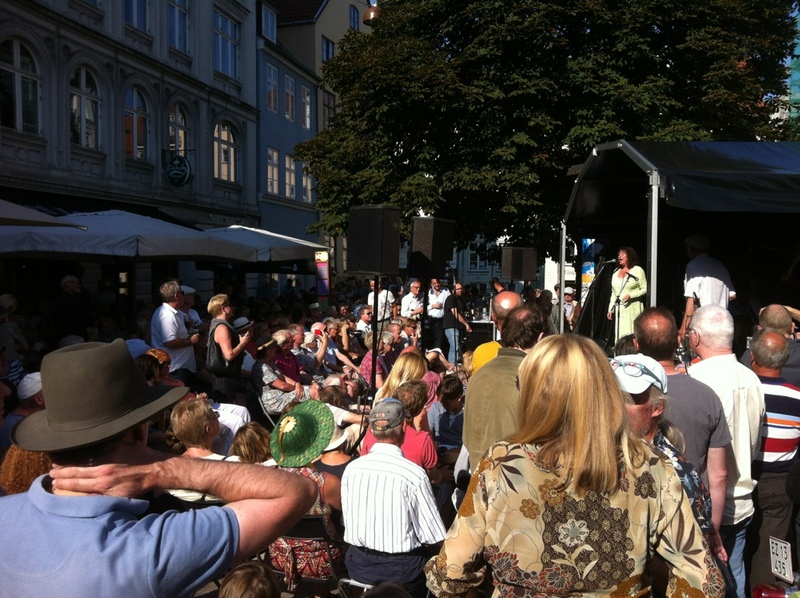 Our holiday officially began Friday last week, but unofficially it started the weekend before when the Copenhagen Jazz Festival kicked off. A full week of live jazz – from traditional New Orleans to world fusion to experimental modern – all over the city. 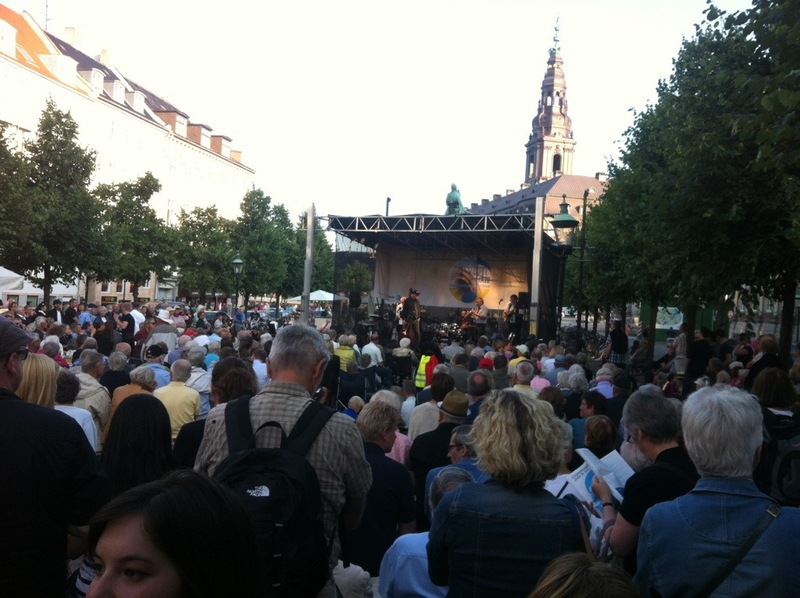 Some concerts were held in dedicated music venues, but the best ones – in my perception – are the free open-air concerts in little squares all over the city. This really is Copenhagen at its best; sunny and warm, with live music playing all over and people having a pint or a glass of wine while relaxing and enjoying Life. And let’s face it: Going to this sort of festival is somewhat more civilised that going to the big rock festivals like Roskilde, where 70.000 people cam out in a field and get drunk around the clock… Now, I quite like camping, but I prefer doing so far away from everybody else, and definitely not somewhere where drunken people will fall over your tent at 4 in the morning. The jazz festival ended this last weekend, so we had our final outing into the world of jazz on Friday evening – which knocked us out the entire Saturday. We’re not as young as we used to be, but we somehow often seem to forget this… Anyway, that meant that we were fit for fight on Sunday, the last day of the festival but more importantly also July 14th, Bastille Day. So there; we’ve been enjoying the best that Copenhagen has to offer, and I think it’s actually been quite nice to play tourist in Copenhagen in the sense that even though we didn’t do any sight-seeing we’ve spent a lot more time about town that we’d normally do. Today we leave the city and head for the garden for a while. I have to go in to work on Thursday for one day only but apart from that we’ll stay in the Summer House for as long as we feel like it. On Saturday we’ll be having our annual Summer Party in the garden; around 20 people for an al fresco lunch, followed by frolicking in the garden with drinks and garden games until the late hours. Some people will go back to Copenhagen in the evening, but most will stay over, either in the house or in tents in the garden. It’s always a great party, and somehow we are lucky enough to have the sort of guests who voluntarily go around the garden the next morning, picking up bits of trash and discarded beer cans so it looks pristine when they all leave. And now I must go wake up the Flâneur Husband… Time for breakfast, and then we’ll be off as soon as we’ve packed our bags! Well, Summer Time starts tomorrow at 2AM – or should I write 3AM? Anyway, today was a mix of things. We got up and had to go up to Elsinore – Helsingør is the real name of the city, but I guess most of you will only have heard of it through Shakespeare – for a funeral. A man my Dad’s age who died of cancer last Saturday. It was a friend of my Mother-In-Law’s, so I didn’t know him very well. I liked what I knew of him, though; he was intelligent, well-read and enjoyed talking ancient Danish history and Medieval literature with me whenever we met at my Mother-In-Law’s. I think, though, that it was the parallel to my Dad’s death that kind of shook me. It was really hard for me to sit at that funeral, harder than I thought it would be. There is still a lingering sadness, remnants of grief. Something – someone – that is not there any more. For all that we didn’t have in common, for all that we didn’t understand in each other, for all that was not right, he was still my father. Was, not is. The past tense can be cruelly acute in certain circumstances. When we came back to Copenhagen I continued – alone, as I needed some solitary time – up to the summer house. The snow has nearly melted in the garden, though there are still patches of white here and there – and a layer of ice on my three miniature ponds – but spring is coming. Some day, and hopefully soon. I wanted to have a few days alone up here, so I will be here until Monday evening. The lawn is littered with branches and other bits of the trees Denis and one of his friends cut down last weekend when they were up here, but that can wait. After all, the lawn won’t need mowing for another month, given that the ground is still frozen in places and the grass hasn’t grown since November. I do have some plants to plant, though, if the ground has thawed where they need to go. Astilbe, sedum, phlox, heuchera, eryngium and loads of other Latin names. And I can sow some hardy annuals so they are ready to germinate whenever the soil warms up to 5 degrees Celsius. All right, so it’s a miserable spring to be gardening in so far, but eventually REAL spring will arrive and there will be stuff growing and flowers blooming – and I will be able to get my dahlias in the ground and set the gladiolus and lily corms. Perhaps later in spring – when we are done with the kitchen rebuild and there will be plenty of weekends in the garden – I might even consider digging out another flower bed in the lawn. The one I dug out in autumn will soon be filled to capacity, so I need more space to plant flowers in. One can attend too many funerals, but one can never have too many flowers. Getting to the kitchen sink this morning was quite a climb – and perhaps not very dignified to look at, had any spectators been around – and I sort of wish I could have had my coffee FIRST and THEN climbed Mount Debris! Anyway, I’m sure you will all be glad to know that I made it safely to the sink and back (and got only one rusty nail up my foot while climbing the daunting Mount Debris) and am now reclining in the safety and comfort of the sofa! So, not much gardening in this blog entry – but then there’s still snow on the ground and nothing to do in the garden anyway. However, the solitary cobea scandens seedling that I posted previously has now been joined by one other seedling – and a third seems to be craning its neck in preparation for emergence, so that will have to do for “spring” right now. On Saturday, though, I’m heading up to the garden anyway to spend some time chopping up the trees that the Flâneur Husband and his friend took down last weekend. I haven’t been up there since the first weekend in March, so it’s about time I went and gave the weather a good talking-to and told it to spring-up and be done with snow and freezing temperatures day and night! 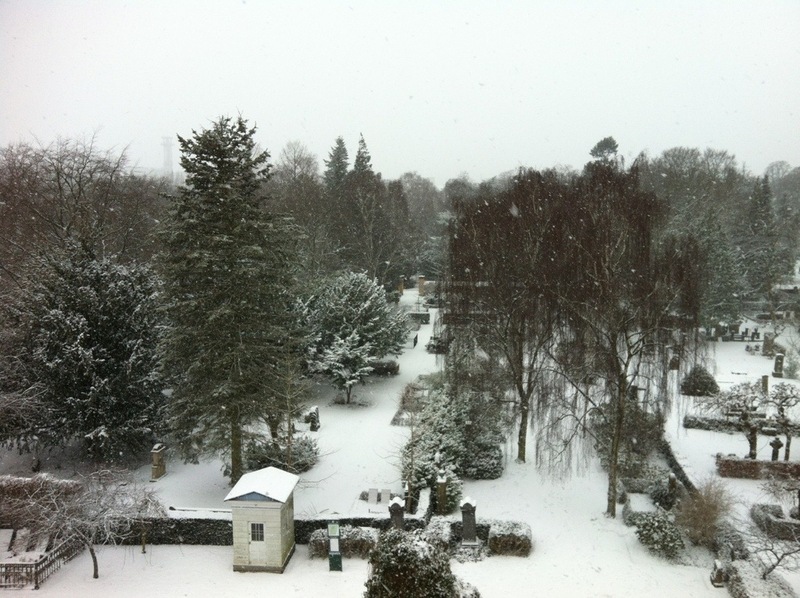 Snow falling heavily outside, covering the cemetery in a blanket of soft, white flakes. Very pretty, but hardly spring – will you agree? But inside I hope it’s growing! 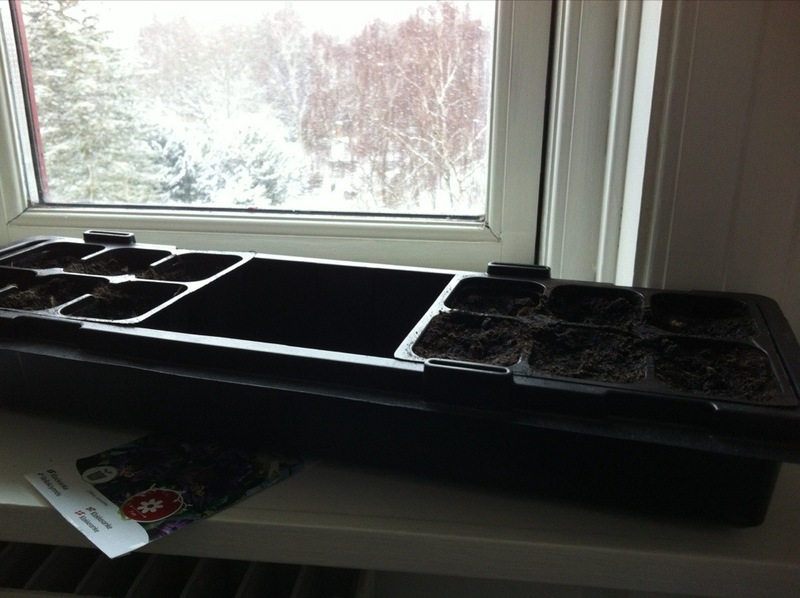 It means we have a little piece of spring – with promise of summer – in our window in the apartment, and I really look forward to seeing something emerge from the soil! 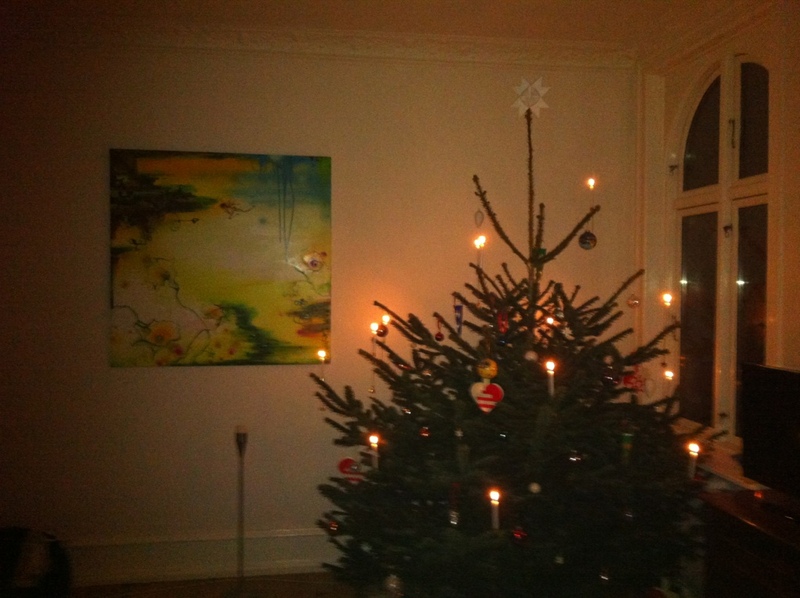 Many cities have Christmas decorations, some more spectacular than others, but I really like Copenhagen at Christmas. Most of the pedestrian streets in the old city centre are hung with fir garlands and various decorations that are illuminated after dark. It might not be as spectacular as the London Christmas lights, but I find it infinitely prettier. Simple, somehow comfortable and absolutely charming. Today the thaw started, and the snow is melting away quickly all over the city. But we might get more frost towards the end of next week, so there’s still the chance of a white Christmas. Fingers crossed, right? In the mean time, how does your city or town deck itself out for Christmas?